Everyday, grocery stores are filled with shoppers reading labels; squinting to see that fat or salt content or looking for those impossible-to-pronounce words. As the nutritionists say, if you can’t pronounce it, you probably shouldn’t eat it. Choosing healthy foods is probably the single most important thing that we can do to keep ourselves, our family and our friends from getting sick. But how accurate are these labels in reality? 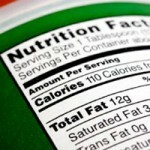 As you will uncover in this article, food companies sometimes slap labels on cans or print information on packages that is more about selling the product than providing its customers with the whole truth. Let’s have a look at the 5 most common misleading labels out on the market. In recent years, most consumers have learned by now that natural foods are much better choices than processed foods. But just because a product is labelled as “all natural” does not necessarily mean that it is. For example, high fructose corn syrup, which is present in foods labelled as “all natural” is in reality a processed ingredient made through a complex chemical process. So why isn’t the government doing anything? The reason why the FDA and USDA do not intervene is simply because they have very vague rules regarding this phrase, thus allowing manufacturers to keep using it as they please. In short, “All Natural” is not a label that is enforced and therefore cannot be trusted. If you’re looking for natural foods, try to look for the approved USDA Organic seal of approval. More info on LABELING ORGANIC PRODUCTS.